The deadline for articles, press releases and sponsored White Papers for the next issue of S&T Journal (e-Digest) No.10, Vol.84, October 2007 is 15 October 2007. You can submit your article or press release online. For more information and instructions of preparation click <here>. Natick, Massachusetts – September 12, 2007 – The North American market for proximity sensors – including capacitive, inductive, magnetic, magnetic actuated, photoelectric and ultrasonic products – totaled $718.8 million in 2006 (exclusive of another $38.4 million in photointerrupter sensors), according to a new market study by Venture Development Corporation. The market for these products has increased at a moderate single-digit average annual growth rate over the last 15 years. 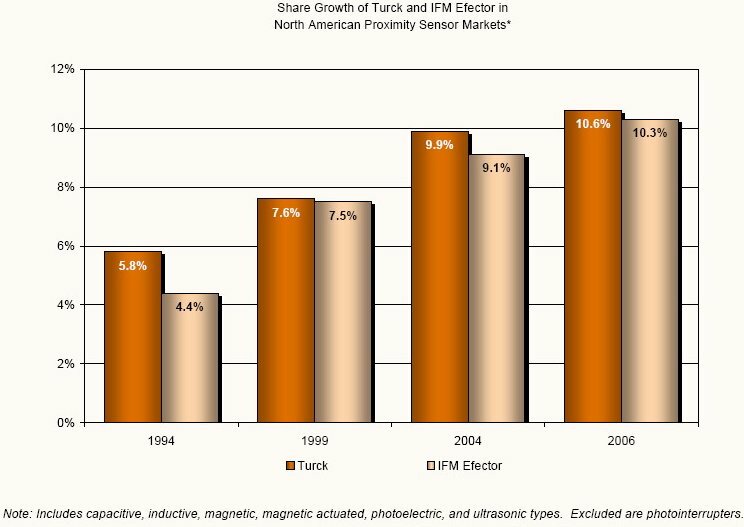 However, during the same period (and particularly during the past three years), two European vendors, Hans Turck GmbH & Co. KG, and IFM Electronics GmbH – through their US subsidiaries Turck, Inc. and IFM Efector, Inc. – have each achieved approximately double the annual market growth rate, and are now the two leading suppliers in the market. By far the largest product segments of the proximity sensor market are inductive and photoelectric sensors. Inductive products are the principal proximity sensors for both Turck and IFM, and these have accounted for most of the overall market gains for both firms. TURCK Inc., the North American arm of privately owned Hans Turck GmbH & Co. KG headquartered in Mulheim in Germany, has operated in the U.S. since 1971. Their proximity sensors are produced in the US, Germany, Switzerland and China, as well as in their newest manufacturing facility built in Saltillo, Mexico in 2004. IFM Efector, based in Exton, PA, is a subsidiary of privately owned IFM Electronic GmbH, which was founded in 1969 and is headquartered in Essen, Germany. Nearly all of IFM Efector’s proximity and photoelectric sensors are manufactured by their parent company in Germany. VDC’s study forecasts a North American market growth rate of 4.3% for these proximity sensors over the next 5 years.